They might have released two stone-cold classics in 1980 but Saxon weren’t about to put their feet up. The New Wave of British Heavy Metal was now in full flow and Saxon were clearly unwilling to relinquish their position as the commercial hot property of the movement. Released in 1981, hot off the back of their considerable success the year before, Saxon’s fourth album Denim and Leather was a celebration. Not just of the band’s success but of their fans and the resurgent metal scene as a whole. After the superb opening the first side is a mixed-bag. Never Surrender is vintage Saxon and follows Princess of the Night in bruising style but the quality starts to trail off. Rough and Ready is a stodgily unconvincing hard-man boast and Play it Loud is a flat stab at a party anthem. Side 2 immediately gets the album back on track with And the Bands Played On, another of the album’s outstanding victories. Despite its musical similarity to 747 (Strangers in the Night) it has its own unique identity and appeal: a feel-good ode to the inaugural Monsters of Rock festival at Castle Donington. As with the title track, Saxon’s everyman charm works wonders: rather than singing about how amazing their own performance was, they celebrate the festival itself, the attending horde and name-check other bands on the bill. It’s got simple, memorable guitar riffs and Biff Byford’s breathless delivery is a joy “Will it rain, will it snow, will it shine? We don’t know” and it’s one of those classics you never tire of hearing. Midnight Rider continues the musical lap of honour, recounting the band’s early tours of the States with the rolling tempo and gear-changing chords perfectly capturing the excitement of the road trip. The album’s most ripping number, the apocalyptic Fire in the Sky, and the triumphant title-track finish the album on a high. 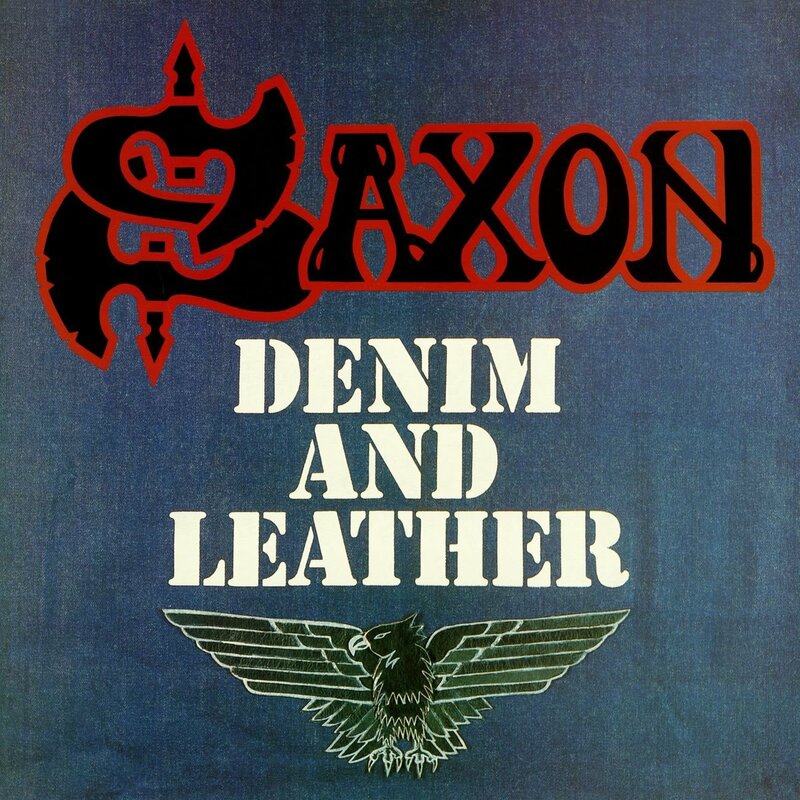 Along with Wheels of Steel and Strong Arm of the Law, Denim and Leather is often thought of as the third in Saxon’s “classic trilogy”. As is often the case with trilogies, the final part is the weakest of the three but it’s still a must-hear with some of the band’s most accomplished songwriting and the guitar duo of Graham Oliver/Paul Quinn at a lively peak. The highlights are magnificent metal classics and far outweighs any filler to elevate the album to star status. It was their second highest charting album in the UK so Saxon’s position at the head of the NWOBHM pack remained secure and just two years on from their debut release they already had a discography and a following worthy of celebration. The dam was well and truly burst. This was my intro to Saxon let’s say 1982 for me I think and let me tell Ya after reading your blog! I’m going to ITunes and buying this now! Thanks for bringing back a classic! LOL! “Great Scott!” WHy have I not thought to say that? HAHAH! Perhaps! In Canada the trains don’t stop! What you call inclement weather is probably what we call Tuesday. Heh Heh. Our trains aren’t that hardy. Ours get called off if there are some leaves on the line. I only own one Saxon album, and it is this one. On CASSETTE. And I don’t think I’ve ever played it (got it for $0.25 somewhere). But based on the strength of this well-written review, I am running post-haste to my cassette deck! Do it! But don’t say I didn’t warn you about the filler. But even then, none of those songs are bad. Just unremarkable. I see words like “everyman charm” and “meat and potatoes”, and normally that kind of description wouldn’t do anything for me. But the fact that it’s YOU, of impeccable taste, that I know the praise to Saxon is well due. Also I’ve been reading up on them during holidays and have learned more of their early period work…2015 is the year for me to dive into Saxon. The praise is well due. These albums are awesome. Glad you’re going to dive to Saxon in this year. It’s overdue! I’ll soon be getting into the era of theirs that I’m most excited about reviewing. Yes your favourite is still to come…maybe that will have to be the first album I buy…. Oh! And I love that they have a balding guy in the band. I have always loved those guys. On behalf of all balding men everywhere, may I presume to thank you. Two balding guys. One of them is wearing a sneaky cap! I loved the way bands cranked out a new classic LP every 8 months back then, before everyone got swimming pools and lazy. Btw try singing ‘Lenim & Deather’ to the title track, its just like the GNR ‘Where the girls are green and the grass is pretty’, once you do it you can’t undo it. No! I’ve already read one review where someone called it Derek and Trevor. That’ll be difficult enough to shake off. The 80s were amazing. It was like they churned out classic albums every other week back then. Although Saxon are still more prolific than most, especially for a band of their vintage. I guess they never graduated to swimming pool level though. Derek & Trevor! That’s just genius, right there. Great album, my favourite one from Saxon. Yes, the Princess of the Night must not have been owned by British Rail. It was probably before privatisation. Bloody Tories! Actually I saw an interview with Biff where he said the real train it was based on was actually the Duchess of Gloucester. But that wouldn’t have made a very good song title. That’s cool this is your favorite. I think this and the previous two are all good enough to be someone’s favourite. I think I probably veer towards Strong Arm myself… But, without spoiling it, my real favourite is still to come! I’ve only recently been discovering Saxon. That Best Of that my friend threw my way is magic. Particularly the stuff from Wheels Of Steel. I tell ya, this is the year I pick up a Saxon record! Great review, too – this one sounds like a right treat. I dare say I’ll seek out all o’ the classic trilogy. That’s great that you’re getting into them. I’d say Wheels and Strong Arm are both pretty flawless. This one, to me, has higher peaks and lower lows. So it averages out as being good! If that makes any sense… All three of the trilogy are definitely worth having. Total sense. My friend has the entire discography (I had no idea they’d been on the go that long) and he’s also threw Crusader my way (though I haven’t listened to that one yet). Awesome! I’ll be getting to that one soon… just a couple more to do before it. It’ll be an interesting one to do. The title track is my favorite Saxon number. One of my favorite songs full stop! This is encouraging. I shall hopefully be fairly familiar with it by the time you get to it! It’s a difficult one, I look forward to hearing your thoughts on it! Love the Saxon posts! A band Ive come to in recent years. The reviews are great for a new follower! Thanks Mike! I’m glad your enjoying these posts! There are plenty more in the pipeline. I’ve been working my way through the 10-CD Saxon “Original Albums” box set for a second time this week. Until a few years ago I had never listened to them and then I got a pretty good compilation which I really liked. When I found that box set at a low price in 2014 I couldn’t resist. The first listen was a little overwhelming since each disc is jam-packed with bonus tracks, so it took a while to get through them. In my second visit I’m only listening to the original albums and it’s been much more enjoyable that way. I’m finally catching up with your Saxon posts and they’re excellent (no surprise there). I remember liking a few of the later albums as much as the ones from the “classic trilogy,” so hopefully you’ll get to those eventually. Thanks for your input Rich and I’m glad you’re liking these posts. I have the bonus track-laden editions too. I’m glad you got those though as the bonus material is very good. I hope to cover the whole discography. There are many later albums that I enjoy as much as, if not more, than the “classic trilogy” and I can’t wait to cover them. There are many overlooked great songs and albums in their catalogue and I’m really pleased you’ve found some of them! Plenty more Saxon posts to come. A grand album is “Denim And Leather”. This album I owned before the first 2 Iron Maiden albums! 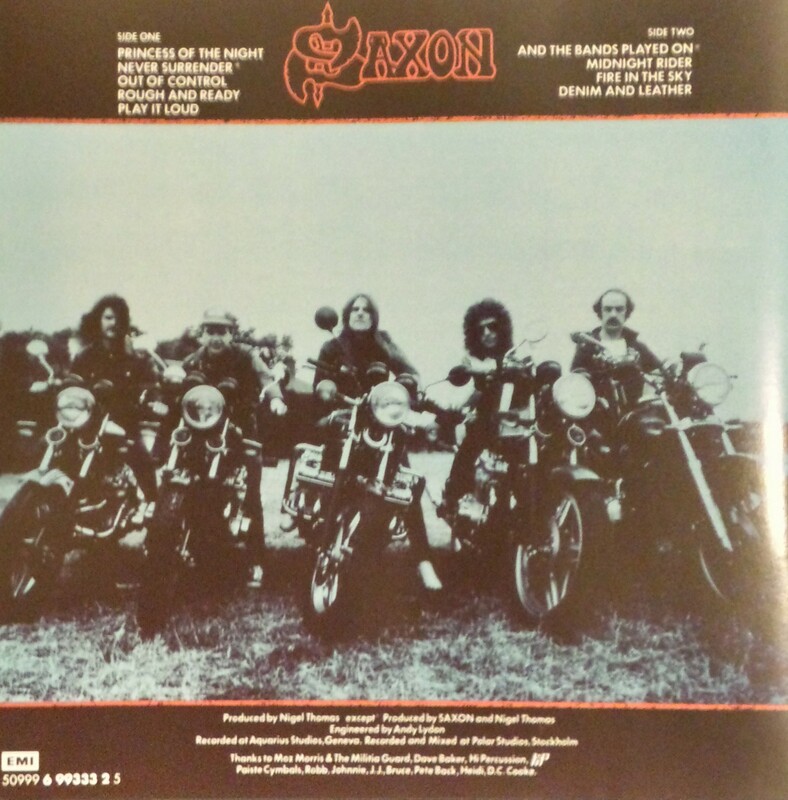 I always love that band photo on the back cover… SAXON are probably the first “biker” Metal band, along with Judas Priest. LOL!! That’s so cool that you were into these guys before Maiden. I’m glad you mentioned the photo too. That picture and the one on the back of Wheels of Steel are probably the coolest they ever looked. 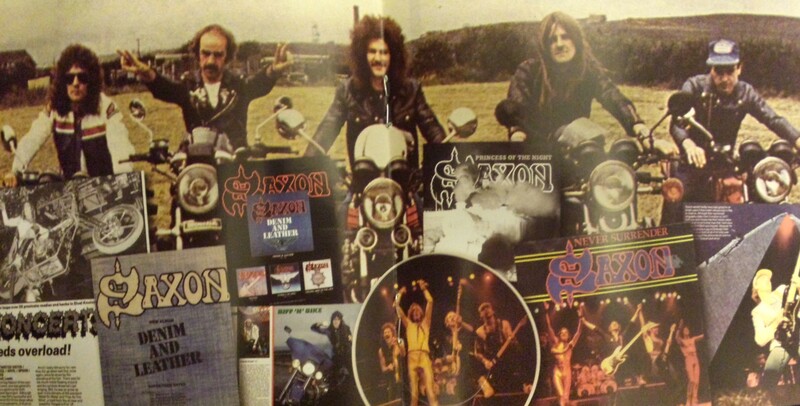 Agreed with the pictures… Saxon just looked so damn ‘street’ back then! Then again, a lot of Metal bands did look that way in those early days… oops, I mean daze. LOL! If you look at pictures of Saxon just a few years later you’d wonder what happened to them haha. So would this be your favourite Saxon album then? I can’t wait to do Crusader. That title track is one of the best songs ever.